Neither David Buchanan nor fellow defender Charlie Goode made any attempt to dress up Saturday’s 3-1 defeat at Cheltenham Town, both admitting the Cobblers were simply ‘not good enough’. 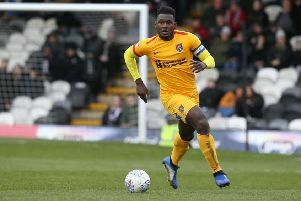 Protecting an eight-game unbeaten run at Whaddon Road, Northampton produced their worst performance for some time in slipping to a deserved defeat, crushing any play-off aspirations in the process. To be honest, throughout the whole game, we didn’t really create a clear-cut chance and we deserved to lose. I wasn’t good enough and I think other players would put their hands up and say the same. Luke Varney’s 19th minute opener was just reward for the home side’s superior start to the game before the same man took his tally to 13 for the campaign when netting from the spot late in the first-half. Tyrone Barnett’s header completed a miserable afternoon for the Cobblers, who at least had the consolation of Dean Bowditch’s free-kick in the final minute. “We didn’t get get going,” Buchanan conceded. “We knew that Cheltenham have been on a good run and we had a gameplan against them but we never started from the first minute to the last. “It’s disappointing because we were second to every ball all afternoon. We went with a plan to turn them and get in behind them and get after them because that’s where we thought they would be weak. “When we did that, at times in the first-half, Willo (Andy Williams) got in three or four times but you have to start games in a better manner. 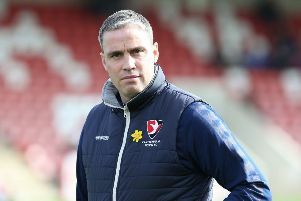 Goode, whose misdirected header led to the award of Cheltenham’s penalty, was equally critical of Town’s display in the Cotswolds as they suffered their first defeat since February 2. “We’ve been on a good run and were eight unbeaten but if you look at the games, we haven’t been playing great football, we’ve just been finding ways to win and we’ve been hard to beat.” he said. “We were the opposite on Saturday. We were easy to play against, we didn’t start the game well and they had acres of space for the first-half and we were hanging on.